The Negotiation Challenge (TNC) began in 2007, and is a competition specially designed to prepare participants for the complex negotiations that will form a part of their everyday professional life after graduation. This year, TNC took place in April in Vienna, Austria. Approximately forty teams representing schools from around the world applied for the Challenge, with only sixteen teams selected to participate. The teams were composed of business and law school students from North America, Europe and Asia. EADA’s team was among those selected to participate. The EADA team was made up of students from both the International MBA (in English) and the International MBA – Bilingual programme. 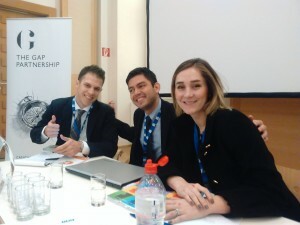 Alejandra Santa Botero, Tomás Fernando Poveda Matiz and Ismael González-Porto travelled to Vienna together with their coach EADA faculty member Jacobus Vos to take part in TNC. The MBA participants were sponsored by local travel agency Ferrer & Sarret. In Vienna, teams from leading international universities and business schools competed against each other in realistic negotiation situations. Teams are called upon to demonstrate their “negotiation intelligence”, or their ability to select the most appropriate method from those available in a given situation. Judges also value participants’ communication skills, understanding of the interests and issues and ability to create value. The EADA team participated in four different types of negotiations, one online and three face-to-face, ranging from individual to multi-party negotiations. Although the final was dominated by American law schools, EADA was a strong competitor at TNC. TNC is designed to provide a unique opportunity to experience diverse ways of negotiation while at the same time strengthening participants’ international network of students from different cultural backgrounds. For EADA’s team, TNC offered a valuable opportunity to put into practice and enhance the negotiation skills acquired in the leadership development modules at the EADA-Residential Training Centre.